Question of the Day: How Big is Your Digital Music Collection? I get tired of music quick, and I'm not much of an archiver, so I don't need a lot of hard drive space or a high capacity MP3 player to store my music. However, there are plenty of folks out there that have taken to collecting digital music with the same voracity as people once did with CDs and vinyl. Fortunately, these days a music collection doesn't require you to add on to your home. 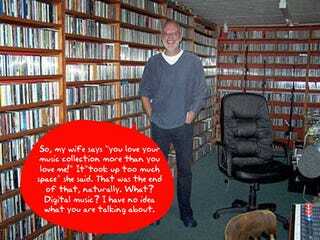 So, the question is: how big is your digital music collection?